1kg tub containing 150 tablets. 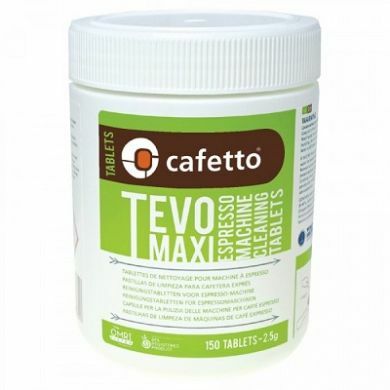 Cafetto Tevo maxi is the first espresso machine cleaning tablet to be certified by an organic certification body. 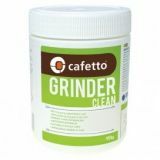 It is the safe, high performance cleaner for professional espresso machines using organic coffee. 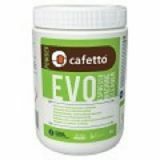 Cafetto Tevo is OMRI listed for use in organic systems. Registered by the BFA for use with organic coffee. Cafetto Tevo maxi is registered to NSF standard P152. Remove coffee filter from group handle, and replace with blind filter. Add one Tevo maxi cleaning tablet into the group handle & insert as if brewing espresso. Start cycle and allow running for 10 seconds to dissolve the tablet. Stop cycle and allow running for 10 seconds. Start and stop cycle 6 more times, run for 10 seconds, stop for 10 seconds. Remove the group handle and rinse well the blind filler under stream of water from delivery group. Turn off. Re-insert handle with blind filter, start and stop cycle 10 times, run for 5 seconds, stop for 2 seconds to ensure thorough rinsing remove blind filter & insert regular filter. Brew & discard a single espresso to re-season machine. Dissolve 2 Cleaning Tablets in 500ml of hot water from the machine's boiler. Soak group handles & filters for 10 minutes. The product has been classified and marked in accordance with EU Directives / Ordinance on Hazardous Materials: Xi Irritant. Risk phrases: 36/37/38 Irritating to eyes, respiratory system and skin. Safety phrases: 2 Keep out of the reach of children. 22 Do not breathe dust. 24/25 Avoid contact with skin and eyes. 26 In case of contact with eyes, rinse immediately with plenty of water and seek medical advice. 46 If swallowed, seek medical advice immediately and show this container or label. 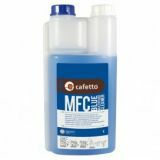 Cafetto is a specialist manufacturer of cleaning and sanitation products for espresso, coffee brewing and dispensing equipment. Cafetto prides itself on innovative and thoughtful solutions always keeping abreast of customers' needs to ensure a clean machine every time.